The Italian Army (Italian: Esercito Italiano) is the land-based component of the Italian Armed Forces of the Italian Republic. The army's history dates back to the unification of Italy in the 1850s and 1860s. The army fought in colonial engagements in China, Libya, Northern Italy against the Austro-Hungarian Empire during World War I, Abyssinia before World War II and in World War II in Albania, Greece, North Africa, Russia and Italy itself. During the Cold War, the army prepared itself to defend against a Warsaw Pact invasion from the east. Since the end of the Cold War, the army has seen extensive peacekeeping service and combat in Afghanistan and Iraq. Its best-known combat vehicles are the Dardo infantry fighting vehicle, the Centauro tank destroyer and the Ariete tank and among its aircraft the Mangusta attack helicopter, recently deployed in UN missions. The headquarters of the Army General Staff are located in Rome, at the back of the Presidential Palace. The army is an all-volunteer force of active-duty personnel. "The safeguard of the republic shall be the supreme law"
Dardo IFV on exercise in Capo Teulada. The Italian Army originated as the Royal Army (Regio Esercito) which dates from the proclamation of the Kingdom of Italy following the seizure of the Papal States and the unification of Italy (Risorgimento). In 1861, under the leadership of Giuseppe Garibaldi, Victor Emmanuel II of the House of Savoy was invited to take the throne and of the newly created kingdom. Italian expeditions were dispatched to China during the Boxer Rebellion of 1900 and to Libya during the Italo-Turkish War of 1911–1912. The Italian Royal Army's first real taste of modern warfare was during World War I. Most of the actions were fought in northern Italy and the Royal Army suffered many casualties. This included over 700,000 dead. In particular, the frequency of the offensives in which Italian soldiers participated between May 1915 and August 1917, one every three months, was higher than demanded by the armies on the Western Front. Italian discipline was also harsher, with punishments for infractions of duty of a severity not known in the German, French, and British armies. During the Interwar Years the Royal Army participated in the Italian Invasion of Ethiopia, provided men and materials during the Spanish Civil War to fight in the Corps of Volunteer Troops (Corpo Truppe Volontarie), and launched the Italian invasion of Albania. On paper, the Royal Army was one of the largest ground forces in World War II, though in reality it could not field the numbers claimed, and it was one of the pioneers in the use of paratroopers. Due to their generally smaller size, many Italian divisions were reinforced by an Assault Group (Gruppo d'Assalto) of two battalions of Blackshirts (MVSN). Reports of Italian military prowess in the Second World War were, almost always, dismissive. This perception was the result of disastrous Italian offensives against Egypt and the performance of the army in the Greco-Italian War. Both campaigns were ill-prepared and executed inadequately. The Italian 10th Army initially advanced into Egypt but surrendered after being pushed back into central Libya and almost all destroyed by a force one fifth its size in the British three-month campaign of Operation Compass. Incompetent military leadership was aggravated by the Italian military's equipment, which predominantly dated back to the First World War and was not up to the standard of either the Allied or the German armies. Italian 'medium' M11, M13, M14 and M15 tanks were at a marked disadvantage against the comparatively heavily armed American Sherman tanks, for example. More crucially, Italy lacked suitable quantities of equipment of all kinds and the Italian high command did not take necessary steps to plan for possible setbacks on the battlefield, or for proper logistical support to its field armies. There were too few anti-aircraft weapons, obsolete anti-tank guns, and too few trucks. The Italian Expeditionary Corps in Russia fought under General Giovanni Messe, who acknowledged the limitations of his Corps in material and equipment and thus was relieved of his command on November 1, 1942. When the Soviet offensive Operation Saturn began on December 12, 1942 the Italian 8th Army was quickly crushed. Only about a third of its troops managed to escape the Soviet cauldron, most notably from the three Alpini Divisions Tridentina, Julia and Cuneense, which fought stubbornly and to almost their total annihilation to escape the Soviet encirclement (see: Battle of Nikolayevka). In North Africa, the Italian 132 Armored Division Ariete and the 185 Airborne Division Folgore fought to total annihilation at the Second Battle of El Alamein. Although the battle was lost, the determined resistance of the Italian soldiers at the Battle of Keren in East Africa is still commemorated today by the Italian military. After the Axis defeat in Tunisia the morale of the Italian troops dropped and when the Allies landed in Sicily on July 10, 1943 most Italian Coastal divisions simply dissolved. The sagging morale led to the overthrow of Italian dictator Benito Mussolini by King Victor Emmanuel III of Italy 15 days later. In September 1943, Italy made an armistice with the Allies and split into the Italian Social Republic – effectively a puppet state of Germany – in the north and that of the Badoglio government in the south. The Italian Co-Belligerent Army (Esercito Cobelligerante Italiano) was the army of the Italian royalist forces fighting on the side of the Allies in southern Italy after the Allied armistice with Italy in September 1943. The Italian soldiers fighting in this army no longer fought for Benito Mussolini as their allegiance was to King Victor Emmanuel and to Marshal of Italy (Maresciallo d'Italia) Pietro Badoglio, the men who ousted Mussolini. As the status of the city of Free Territory of Trieste was disputed by the Socialist Federal Republic of Yugoslavia the Italian army moved the Folgore to Treviso and the Mantova to Gorizia in 1947. At the same time the army began the process of raising an additional seven divisions, and five Alpini brigades. Following the creation of NATO, the Italian Army was integrated into NATO's Allied Forces Southern Europe and prepared for a feared invasion from the east, possibly via Yugoslavia. 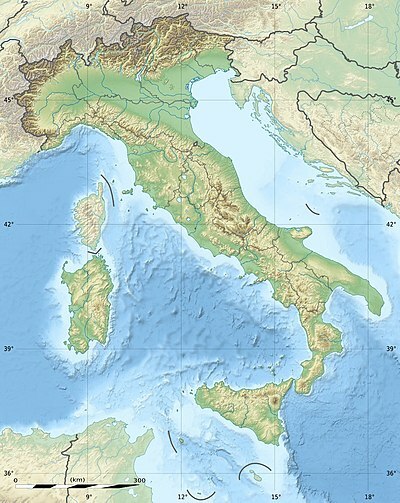 Allied Land Forces Southern Europe (LANDSOUTH), was activated on 10 July 1951 to defend northeastern Italy. The command was headquartered at Verona, and placed under Lieutenant General Maurizio Lazzaro De Castiglioni. Some three infantry divisions and three brigades were the only forces initially available to this command to defend northeastern Italy. The divisions in question were the Infantry Division Mantova in Gorizia, the Motorized Infantry Division Folgore in Treviso, the Motorized Infantry Division Trieste in Bologna. Two of the three brigades were Alpini mountain infantry brigades – the Julia Alpine Brigade in Cividale del Friuli and Tridentina Alpine Brigade in Brixen, while the third brigade was the Ariete Armoured Brigade in Pordenone. Exercise "Italic Weld", a combined air-naval-ground exercise in northern Italy involving the United States, Italy, Turkey, and Greece, appears to have been one of the first exercises in which the new Italian Army orientation was tested. On 1 May 1952 the army activated one army command and two corps commands, the Third Army in Padua, and the IV Army Corps in Bolzano and V Army Corps in Vittorio Veneto, to be able to circumvent NATO's chain of command in case a war should break out between Italy and Yugoslavia for the Free Territory of Trieste. Later in 1952 the army also raised the VI Army Corps in Bologna, followed by the III Army Corps in Milan in 1957, both of which were also assigned to the Third Army. While the Cremona division was reduced to a brigade, the Granatieri di Sardegna and Legnano divisions, and the Pozzuolo del Friuli brigade were split to create two new brigades each. Afterwards the three divisions ceased to exist. The remaining four divisions were also subjected to major changes and reductions, however, unlike the above three divisions, they remained in service after the reform. The units of the Folgore and Mantova divisions were mostly disbanded and the remnants used to create one brigade each; then the two divisions were augmented by two brigades each to bring back up to strength. The Centauro division was split into two brigades and then brought back to full strength by adding the Mechanized Brigade Legnano. Only the Ariete division saw no reduction of its ranks and its three regiments were used to create three brigades. At the end of the Cold War in 1989 the Italian Army consisted of 26 Combat Brigades: four Armored Brigades, ten Mechanized Infantry Brigades, five Motorized Infantry Brigades, five Alpine Brigades, one Rocket Artillery Brigade and one Airborne Brigade. The Armored Brigades consisted of one Command & Signals Battalion, two or three Tank Battalions with Leopard 1A2 tanks, one Mechanized Infantry Battalion with M113 APCs, one Self-propelled Field Artillery Group with M109 howitzers, one Logistic Battalion, an Anti-Tank Company and an Engineer Company. The Mechanized Brigades consisted of one Command & Signals Battalion, one Tank Battalion (Leopard 1), three Mechanized Infantry Battalions (M113), one Self-propelled Field Artillery Battalion with M109 howitzers, one Logistic Battalion, an Anti-Tank Company and an Engineer Company; however the Pinerolo Mechanized Brigades fielded a Field Artillery Group with FH-70 howitzers. Additionally the Gorizia and Mantova mechanized brigades fielded two Position Infantry battalions each, which were tasked with manning fortifications and bunkers along the Yugoslav-Italian border. The Motorized Brigades consisted of one Command & Signals Battalion, one Armored Battalion (a mixed unit of tanks and mechanized infantry), three Motorized Infantry Battalions, one Field Artillery Group (FH-70), one Logistic Battalion, an Anti-Tank Company and an Engineer Company; however the Sassari Brigade did not contain a field artillery battalion. The Folgore Parachute Brigade did field one Command & Signals Battalion, one Parachute Assault Battalion (a Special Forces Unit), three Parachute Infantry Battalions, one Airborne Field Artillery Group with Mod 56 howitzers, one Logistic Battalion, one Army Aviation Helicopter Battalion and an Engineer Company. Three of the five Alpine Brigades consisted of one Command & Signals Battalion, two Alpini Battalions, one Alpini Training Battalion, two Mountain Artillery Groups (Mod 56), one Logistic Battalion, an Anti-Tank Company and an Engineer Company; while the Tridentina brigade fielded an Alpini d'Arresto Battalion instead of the Alpini Training Battalion. The exception was the Julia Alpine Brigade which consisted of one Command & Signals Battalion, four Alpini Battalions, one Alpini d'Arresto Battalion, one Alpini Training Battalion, three Mountain Artillery Battalions, one Logistic Battalion, an Anti-Tank Company and an Engineer Company, making the Julia the largest brigade of the Italian Army. The d'Arresto Alpini and Infantry units were designated to hold specific fortified locations directly at the border to slow down an attacking enemy. They were not a maneuver element but attached for training and logistic purposes to brigades stationed closest to the border. The Missile Brigade Aquileia fielded a mix of heavy artillery and missile units, both capable of firing tactical nuclear weapons. The main missile weapon of the brigade was the MGM-52 Lance missile. M60A1 Two battalions per Armored Brigade, one battalion per mechanized brigade, while the Ariete brigade fielded three tank battalions. Each tank battalion fielded three tank companies of 16 tanks and one tank for the battalion commander for a total of 49 tanks. M113 APC Armored battalions combined tanks and mechanized infantry and one was assigned to each Motorized Brigade. Two battalions were attached to the 4th Army Corps, one battalion to the Capital Command in Rome, one battalion of the 5th Army Corps and two were training battalions of the Armored Cavalry School in Lecce. 2 Reconnaissance Squadrons Leopard 1A2 Originally each division had one reconnaissance squadron, with the abolition of the divisional level one squadron was reformed as tank squadron and joined the Brescia brigade, one was reformed as mechanized squadron and joined the Vittorio Veneto brigade, while the two remaining reconnaissance squadrons joining the Mameli and Pozzuolo del Friuli brigades. 34 Mechanized Infantry M113 APC One battalion per Armored Brigade, three battalions per mechanized brigade. The twelve Bersaglieri battalions were without exception mechanized infantry units; the remainder of the mechanized infantry were two Granatieri di Sardegna battalions, sixteen infantry battalions and three cavalry squadrons. One battalion as training and demonstration unit as part of the army's Infantry and Cavalry School in Cesano. 11 Motorized Infantry Two battalions per motorized brigade and one battalion in Triest as part of the Vittorio Veneto brigade tasked with defending the city in case of a Yugoslavian attack. 13 Alpini Two battalions per Alpine Brigade; with the Julia brigade fielding a total of four Alpini battalions, an additional battalion under the Military Alpine School in Aosta. 5 Parachute Infantry One Carabinieri parachute battalion, two infantry parachute battalions, and one parachute assault (Special Forces) battalion. Additionally the 4th Army Corps fielded an Alpini parachute Company. 7 d'Arresto Two Alpini and 5 infantry battalions designated to hold specific fortified sectors of the Eastern Italian border. 2 Amphibious Infantry LVT-7 One amphibious infantry battalion (Lagunari), one amphibious vehicle battalion and one training company tasked with defending Venice under the Amphibious Troop Command. 33 Training Battalions The training battalions were tasked with the basic training of draftees: four Alpini training battalions trained draftees destined for Alpine units, one parachute infantry battalion trained the parachute brigades recruits, one battalion the recruits destined for the Aquileia Artillery brigade, one Granatieri battalion the recruits destined for the Granatieri di Sardegna brigade, while the remaining 26 infantry battalions, trained all incoming recruits regardless of which unit they would ultimately be assigned to. 11 Self-Propelled Artillery M109 howitzers One group (equivalent to a battalion) per armored and mechanized brigade (with the exception of the Pinerolo, Legnano, Trieste, Granatieri di Sardegna and Brescia mechanized brigades), two groups in one regiment under 3rd Army Corps, one battery as part of the army's artillery school in Rome and one training battery on Sardinia. 19 Field Artillery M114 howitzers One group per motorized brigade (with the exception of the Sassari Motorized Brigade), one group per Alpini brigade, one group in Pinerolo, Legnano, Trieste, Granatieri di Sardegna and Brescia mechanized brigades, one group under 5th Army Corps, one under VII Territorial Command, three in Southern Italy under X Territorial Command and one battery as part of the Army's artillery school in Rome. 6 Mountain Artillery Mod 56 howitzers One group per Alpine Brigade, with the Julia Alpine Brigade fielding and additional group. 1 Airborne Artillery Mod 56 howitzers One airborne field artillery group as part of the Folgore Parachute Brigade. 8 Heavy Field Artillery FH-70 howitzers Heavy Field Artillery groups served as Corps Artillery: two under 3rd Army Corps, two under 4th Alpine Army Corps, four under 5th Army Corps and one battery as part of the army's artillery school in Rome. 1 Heavy Artillery M115 howitzers One group under 5th Army Corps. Originally capable of firing tactical nuclear ammunition and part of the Aquileia artillery brigade, the unit lost its nuclear role in 1986. 1 Heavy Self-Propelled Artillery M110 howitzers One group as part of Aquileia brigade capable of firing tactical nuclear ammunition. 1 Missile Artillery MGM-52 Lance later M270 MLRS The only missile artillery group of the army was capable to firing tactical nuclear missiles. 8 Target Acquisition Seven Artillery Specialist Groups with artillery radars and drones supporting the army corps and one target acquisition group supporting the Missile Brigade Aquileia. 5 Light Air-defense Artillery FIM-92 Stinger 40/70 Anti-air guns All under operational control of the Army's Air-defense Artillery Command, one tasked with defending the Air Force's airfields in Italy's North-East. 4 Air-defense Missile Artillery MIM-23 Hawk Grouped in two regiments under operational control of the Army's Air-defense Artillery Command. 17 Engineer Battalions Engineer battalions were under the Army Corps' and the Military Regional Commands and came in various specializations: Eight pioneer battalions tasked with construction duties, two combat engineer battalions supported the Army Corps', two railway construction and two bridge construction battalions were grouped into two regiments under the Army's Engineer Inspectorate, one pioneer battalion served as training and demonstration unit under the Army's engineering school, while two mining battalions were tasked with building and maintaining fortifications in the Alpine border regions of Italy. Additionally 24 Combat Engineer companies supported each of the army's brigades (with the exception of the Sassari brigade). 5 Reconnaissance Helicopter AB 206 A109 EOA Four squadrons flying AB 206 and one squadron flying A109 EOA helicopters. 7 Transport Helicopter AB 205 AB 412 CH-47 Chinook One squadron flying CH-47 Chinook Helicopters in Viterbo and six squadrons flying AB 412 and AB 205 helicopters. 6 General Aviation AB 212 SM-1019 The squadrons were dispersed all over the nation and supported various regional commands. 17 Signal Battalions Additionally two independent companies. 1 NBC-defense Battalion Part of Engineer corps, but under direct command of the Army's General Staff. 25 Logistic Battalions One logistic battalion per brigade; with the exception of the Sassari brigade. 6 Logistic Maneuver Battalions The logistic maneuver battalions ensured the mobility and logistic support of the Army's three Corps Commands. 9 Transport Battalions Transport battalions provided mobility and logistic support to Territorial Commands and the Army and Armed Forces General Staffs in Rome. 26 Command and Signal Battalions One command and signals battalion per brigade, one for the Army's Air-defense Artillery Command and a Command and Signals Company for the Amphibious Troop Command. In 1991 the Army began the post-Cold War draw-down of its forces with the disbandment of seven brigades and a large number of smaller units. The brigades disbanded in 1991 were the Aquileia, Brescia, Goito, Mameli, Orobica, Trieste and Vittorio Veneto. The units subordinated to these brigades were mostly disbanded, while the Garibaldi brigade command was transferred with one of its battalions to Campania. With the relaxing military situation the Italian Army kept drawing down forces and disbanding smaller military units, which necessitated a major reorganization by 1997 to merge the remaining battalions into coherent units and to disband now superfluous brigade commands. Thus a further six brigades were disbanded during the latter half of 1996 and 1997: Acqui, Cadore, Cremona, Gorizia, Legnano and Mantova. In addition the remaining units were moved to new bases, changed composition, designation and tasks. The three Army Corps's were renamed and their functions expanded: the 3rd Army Corps became the Projection Forces Command (COMFOP) commanding the rapid reaction forces of the Army, the 4th Alpine Army Corps became the Alpine Troops Command (COMALP) focusing on peace-keeping operations and the 5th Army Corps became the 1st Defense Forces Command (COMFOD1) tasked with defending Northern Italy. On January 1, 1998 the 2nd Defense Forces Command (COMFOD2) was activated in Naples and tasked with defending South and Central Italy. During the Cold War the Italian Army units were to be commanded during war by NATO's LANDSOUTH Command in Verona, on October 1, 1997 out of elements of the aforementioned NATO Command the new Operational Terrestrial Forces Command (COMFOTER) was activated. The COMFOTER took command of all the combat, combat support, combat service support and CIS units of the Italian Army. Along with the COMFOTER in Verona a Support Command (COMSUP) was raised in Treviso, which gained operational control of all the remaining combat support, combat service support and CIS units of the Army. The COMSUP controlled three division sized formation (Army Aviation Command, Air-Defense Artillery Command, C4-IEW Command) and three brigade sized formations (Field Artillery Brigade, Engineer Brigade, Logistic Support Command). Between 1997 and 2002 the Army continued to tweak the new structure and with the abolition of obligatory military service a further two brigades (Centauro, Tridentina) were disbanded in 2002. On December 1, 2000 the COMFOP became the NATO Rapid Deployable Corps Italy (NRDC-IT) and passed its subordinate units to the COMFOD 1 (Friuli, Folgore) and COMFOD 2 (Garibaldi) commands. The Friuli Brigade changed composition and became an airmobile brigade with Army Aviation, Cavalry and Infantry units. The COMSUP had already been reorganized and streamlined in 2000. In 2013 the Army began a major reform. The three corps level commands COMFOD 1, COMFOD 2 and COMALP were disbanded and the Mantova Division Command moved from Vittorio Veneto to Florence, where it was renamed as Division "Friuli", taking the name and traditions of the Friuli Air Assault Brigade. Together with the other two divisions Acqui and Tridentina it took command of the operational brigades of the Italian Army. The Logistic Projection Command was disbanded and its units transferred to the brigades. As part of the reform the Army created the new Army Special Forces Command (COMFOSE) in Pisa, which took command of all Special Operations Forces of the Army. Furthermore, the Operational Terrestrial Forces Command (COMFOTER) in Verona was split on 1 October 2016 into the COMFOTER – Army Operational Command in Rome and the COMFOTER – SUPPORT Command in Verona. 1x air-assault brigade (Pozzuolo del Friuli Brigade) with Pumas, A129 Mangusta attack and NH90 transport helicopters. However, as of March 2018 the merger of the Airmobile Brigade Friuli and the Cavalry Brigade Pozzuolo del Friuli, as well as the disbanding of the Granatieri di Sardegna Brigade, are on hold. Each maneuver brigade, with the exception of the Pozzuolo del Friuli and Sassari brigades, will field the following units after the reform: one combat service support battalion with the brigade staff, one cavalry reconnaissance regiment, three combat maneuver regiments, one artillery regiment, one engineer regiment, one logistic regiment. The Pozzuolo del Friuli brigade will field a cavalry reconnaissance regiment, an air-assault infantry regiment, an amphibious-assault infantry regiment, an army aviation reconnaissance helicopter regiment, an attack helicopter regiment, a field artillery regiment, an engineer regiment, a logistic regiment as well as the standard combat service support battalion with the brigade staff. The Sassari brigade will not field a cavalry reconnaissance regiment and an artillery regiment, unless funds can be found to raise these units on the island of Sardinia. All army schools, training regiments and training centres will be combined into the newly raised Army Formation, Specialisation and Doctrine Command (Comando per la Formazione, Specializzazione e Dottrina e dell’Esercito or COMFORDOT) in Rome. The Italian Army has participated in operations to aid populations hit by natural disasters. It has, moreover, supplied a remarkable contribution to the forces of police for the control of the territory of the province of Bolzano/Bozen (1967), in Sardinia ("Forza Paris" 1992), in Sicily ("Vespri Siciliani"1992) and in Calabria (1994). Currently, it protects sensitive objects and places throughout the national territory ("Operazione Domino") since the September 11 attacks in the United States. The army is also engaged in Missions abroad under the aegis of the UN, the NATO, and of Multinational forces, such as Beirut in Lebanon (1982), Namibia (1989), Albania (1991), Kurdistan (1991), Somalia (1992), Mozambique (1993), Bosnia (1995), East Timor and Kosovo (both in 1999), the Democratic Republic of the Congo (2001), Darfur (2003), Afghanistan (2002), Iraq (2003) and Lebanon again (2006) (in fact from 1980, Italy was the third major world contributor, after USA and UK, in peacekeeping missions). The Carabinieri, once the senior corps of the Army, is now an autonomous armed force (alongside the Army, Navy and Air Force). The Carabinieri provide military police services to all the Italian armed force. The Armed Forces of Italy are under the command of the Italian Supreme Defense Council, presided over by the President of the Italian Republic. Ranks are part of the uniform. For the detailed structure of the Italian Army see Structure of the Italian Army. Collar patches worn by soldiers of the Italian Army. All brigades have been deployed and are continuously deployed in operations outside of Italy. Combat brigades field between 3–5,000 troops each. Brigade maneuver units are designated regiments, but field men and equipment similar to a large battalions, with each consisting of large Command and Logistic Support Company, and a combat battalion. Artillery regiments field and additional Surveillance, Target Acquisition and Tactical Liaison Battery. Depending on the type of brigade (light, medium, heavy) each standard brigade also fields three maneuver battalions. Currently the Folgore, Taurinense, and Julia each field three light infantry regiments, the Pinerolo and Aosta each field three medium infantry regiments, and the Garibaldi and Ariete field two, respectively one heavy infantry regiment, and one, respectively two tank regiments. The Friuli, Sassari, Granatieri di Sardegna and Pozzuolo del Friuli brigades' regiments are structured like all other army regiments, however these four brigades do not field the full complement of eight units as the army's standard brigades. The three regiments of the Sassari brigade are still equipped with a modernized version of the M113 armored personnel carrier. Their future equipment and thus their future organization will depend on the size of the army's budget in the coming years. Attack helicopter Agusta A129 Mangusta. The Italian Army uses uniforms that can be divided into four different "families", and hold strict rules that apply to the type of textile, color and badge of the uniforms.. These include: the Regular Uniform (the only one that includes seasonal variations), the Service Uniform, the Service Combat Uniform, and the Ceremonial Uniform (only for officials). The Regular Uniform includes both summer and winter versions, with the textile used being the only difference. A single-breasted jacket with four buttons and four pockets, as well as trousers that come with a classic cut and front pleats which have five pockets. The shirt worn underneath the jacket also has two small pockets. The uniform is completed with a necktie, brown leather gloves, brown shoes, khaki socks and a cap or headdress. The summer and winter Service Uniform have identical cuts and colors to the Regular uniform, while active military personnel always utilize a special headdress included with the uniform. The Service Combat Uniform is most commonly used out of the four "families", and is distributed to all soldiers with the same mimetic pattern (paratroopers have a different model with a strengthening on the shoulders). The uniform is composed of a beret, a five button closure jacket with two internal pockets, and trousers with four pockets. Accessories completing the uniform include gloves, special footwear and a t-shirt with short or long sleeves, depending on the season. The Ceremonial Uniform includes a double-breasted jacket with six buttons and two pockets on the hips. Trousers come with a classic cut in fabric, as well as the jacket. The winter version can be worn with the blue cape infantry, a black rigid cap, white gloves and black shoes. There are other accessories such as the necktie, a light blue scarf and a sabre that complete the uniform. A post-World War II peace treaty signed by Italy prevented the country from deploying military forces in overseas operations as well as possessing fixed-wing vessel-based aircraft for twenty-five years following the end of the war. This treaty expired in 1970, but it would not be until 1982 that Italy first deployed troops on foreign soil, with a peacekeeping contingent being dispatched to Beirut following a United Nations request for troops. Since the 1980s, Italian troops have participated with other Western countries in peacekeeping operations across the world, especially in Africa, Balkan Peninsula and the Middle East. As yet, the Italian Army has not engaged in major combat operations since World War II; though Italian Special Forces have taken part in anti-Taliban operations in Afghanistan as part of Task Force 'Nibbio'. Italy was not yet a member of the United Nations in 1950, when that organization went to war with North Korea. Italy did take part in the 1990–91 Gulf War but solely through the deployment of eight Italian Air Force Panavia Tornado IDS bomber jets to Saudi Arabia; Italian Army troops were subsequently deployed to assist Kurdish refugees in northern Iraq following the conflict. As part of Operation Enduring Freedom in response to the September 11, 2001 attacks, Italy contributed to the international operation in Afghanistan. Italian forces have contributed to ISAF, the NATO force in Afghanistan, and a Provincial reconstruction team and 53 Italian soldiers have died under ISAF. Italy has sent 4200 troops, based on one infantry company from the 2nd Alpini Regiment tasked to protect the ISAF HQ, one engineer company, one NBC platoon, one logistic unit, as well as liaison and staff elements integrated into the operation chain of command. Italian forces also command a multinational engineer task force and have deployed a platoon of Italian military police. Actually, Italy leads the Regional Command West in Afghanistan, and its HQ is located in Herat in the base of Camp Arena. Italian Air Force deployed about 30 aircraft among helicopters and planes; some of them are: four AMX Ghibli and two RQ-1A Predator that are used in close air support and intelligence missions, Alenia C-27J Spartan, Boeing CH-47C Chinook, NH90 and Lockheed C-130 Hercules, which are used in transport missions; Bell UH-1N Twin Huey and Agusta A129CBT Mangusta are used in missions of fire support to the troops . The Italian Army did not take part in combat operations of the 2003 Second Gulf War, dispatching troops only after May 1, 2003 – when major combat operations were declared over by the U.S. President George W. Bush. Subsequently, Italian troops arrived in the late summer of 2003, and began patrolling Nasiriyah and the surrounding area. On 26 May 2006, Italian foreign minister Massimo d'Alema announced that the Italian forces would be reduced to 1,600 by June. As of June 2006 32 Italian troops have been killed in Iraq – with the greatest single loss of life coming on November 12, 2003 – a suicide car bombing of the Italian Carabinieri Corps HQ left a dozen Carabinieri, five Army soldiers, two Italian and eight Iraqi civilians dead. As of 2006, Italy ranks third in the world in number of military forces operating in peacekeeping and peace-enforcing scenarios Afghanistan, Kosovo, Bosnia and Herzegovina, and Lebanon following only the United States and United Kingdom. A recent law promotes membership of the Italian Army giving volunteers a chance to find post-Army careers in the Carabinieri, Italian State Police, Italian Finance Police, State Forestry Department, Fire Department and other state bodies. Guardia alla Frontiera, a Border guard created in 1937 who defended the 1,851 kilometres (1,150 miles) of northern Italian frontiers with the so-called "Vallo Alpino Occidentale" (487 km (303 mi) with France), "Vallo Alpino Settentrionale" (724 km (450 mi) with Switzerland and 420 km (261 mi) with Austria) and "Vallo Alpino Orientale" (220 km (137 mi) with Yugoslavia). The Guardia alla Frontiera disappeared after 1943, but was officially active until 1953. ^ "Chapter 9". NATO the first five years 1949–1954. NATO. Archived from the original on 2008-11-10. Retrieved 2008-11-03. ^ "31 marzo 1972. Riordino degli Alti Comandi Militari" (PDF). Italian Parliament. Archived (PDF) from the original on 2017-12-23. Retrieved 23 December 2017. ^ "Notizie, Eventi – Esercito Italiano". Esercito.difesa.it. Archived from the original on 2013-10-19. Retrieved 2016-12-19. ^ "La storia degli Alpini nel web - Storia della Guardia alla Frontiera". Vecio.it. Archived from the original on 2016-03-07. Retrieved 2016-12-19. ^ "Ordinamento Settoriale della Guardia alla Frontiera". Valloalpino.altervista.org. Archived from the original on 2017-04-17. Retrieved 2016-12-19. Wikimedia Commons has media related to Army of Italy.